I am so excited to show you our new fire pit! We started on May 18, thinking we'd have it ready for the start of summer. Ha! We should have known better. With obstacles such as rain, temperatures in the 90's two different weeks and a stump that wouldn't let go, we finally completed our project July 27, just hours before our first bonfire. Thank goodness for deadlines! Here's a sneak peak at the finished product. After the step-by-step photos, I'll have more pictures of the completed project at the end of the post. While we have ample property, the land we consider our back yard was small and all downhill. 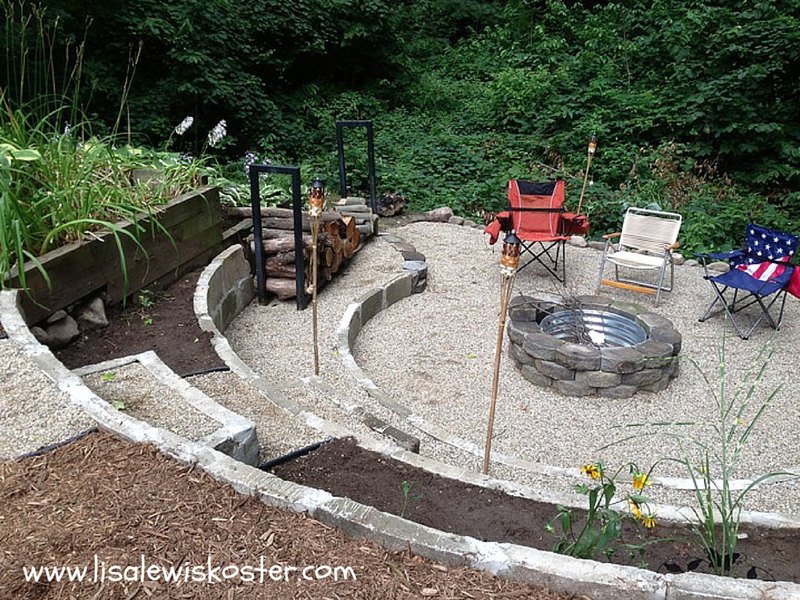 In order to have a fire pit, we (ok, Bob) had to terrace the dirt and create a level spot down at the bottom. That meant digging out at the top and filling in at the bottom. These photos give you an idea of how much of a slope we have and how much dirt had to be moved. The patio you see in the background was another D-I-Y project from a few years back. That project took two years - one to build the retaining wall and another to put in the fill and lay the pavers. Bob used the stake to mark the center of the fire pit. The second stake, attached by a string, was used to mark the location of the lowest retaining wall, giving it it's circular shape. No wonder Papa is making such good progress; Dude is a great helper! We used old stakes from when we had lawn service (back in the day) to mark where the tiers needed to be. The tiers are coming along nicely, the lower landing is being built up and the hydrangea has been relocated to my sister's house. If it wasn't for this stump, we'd be well on our way! Evidently stumps are like icebergs - you only see a fraction of them above the surface. This is what remained after THREE WEEKS of digging it out, chopping it with an ax, cutting it with a chain saw AND lighting fires beneath it. Exactly one month after breaking ground we beat the stump! This chunk is all that remains, and it was so heavy Bob had to roll it out of the way! He'd already burned up two other pieces that size as well as numerous smaller ones. I think it only fitting that this be the fuel for our first bonfire. Our daughter wanted to dispose of some edging blocks from her yard, so Bob turned them upside-down and used them as forms for the footings. The walls were made with old blocks from a silo that had been torn down. They're extra-special because of the family connection. With the first row of silo blocks in, Bob prepared to pour footings for the next wall and the step. We had some extra landscaping blocks, so they went in at the base of the plant bed to give us a level surface. Here's another re-purposed item, a log rack that had been next to the pole barn, covered with overgrowth. Ah, now it's starting to look like something! Two of the only items we purchased, pea gravel and landscaping fabric, were added down at the bottom level. Landscaping fabric because I already have enough weeds to pull out of my flower beds, thank you very much! I pulled the big rocks from around the yard to make a backstop between the edge and the woods. While I was at it, I replaced the weeds that had grown up in the steps between our hosta beds with more fabric and gravel. While the bottom two levels were covered with pea gravel, we left the top level dirt, thinking since it's farther from the fire it should be safe for plants. I split some of my existing perennials to give it a finished look. Ta da! Here's a rare photo of Bob sitting down! One of my small contributions to the project was hauling the wood from where Bob cut it and stacking it on the log rack. I picked up some Tiki Torches, already marked down. Evidently once the Fourth of July is passed, summer is all but over. The torches not only helped keep the mosquitoes away (although we have plenty of bats around to help with that) but added quite a bit of light later in the evening. God even blessed us with unseasonably cool weather for us to make our first bonfire more enjoyable. Here's to many more! That is very cool. Congratulations on a beautiful, and finished project. that is awesome! i'm going to share your picture with a friend of mine with a hilly yard like yours-this was exactly what I was saying she should do with it! great job! What a great project! I'm sure you will enjoy the fire pit so much. Thanks for sharing with us at TTF. WOW That looks fantastic!!!!! Come share this on a party I cohost- DIY Sunday Showcase. It opens at 5pm central! Oh wow! That is gorgeous! My loved ones' Victorian Farmhouse has a much simpler one. But whether simple or gorgeous like this, the best part is definitely the family fun, smiles, and laughter as you enjoy time together around it! And I suspect you and your family will have plenty of moments like that with yours, just as my loved ones have enjoyed. Thank you for a delightful visit for Home Sweet Home. Blessings! What a huge job but it came out FANTASTIC!!!!!! Love the terraces! !And the fire pit area looks so great!! What a really wonderful project that i am sure you and your family will enjoy for many years to come!! My yard is very small but I have made the most of it!! Lisa, I love your fire pit! We have a similar yard that goes up behind the house. Your project has given me some great ideas! Thank you so much for sharing on the HomeAcreHop! Hope you come back again this week! That is awesome! Love the way it steps down! Thank you for joining HSH! I will feature this today! What a great idea and it turned out fabulous!!! 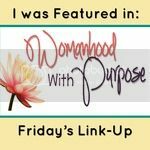 Thanks for linking up to our "Inspire Me Please" blog party....I'm featuring you this week! 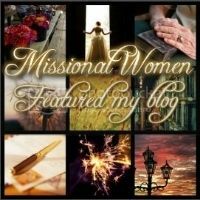 I wanted to stop by and thank you for stopping by my blog last weekend. And WOW I found this cool post, I love your fire, its kind like a great room. You have a very talented husband and have wonderful place.